Sure, why not. Homer didn’t pass remedial science in high school, but he can play chess. Paton Oswald has decided to put his fingerprints on this murder scene, so hopefully that works out for him. Also apparently he is voicing Bart’s manifestation of guilt, which means we are probs going to hear a lot of guilty horn music. Well, you will, I am not watching. Yes Homer turns out to be a chess genius. The ‘explanation’ is revealed in flashback scenes set to Mozart’s Requiem, because why not. 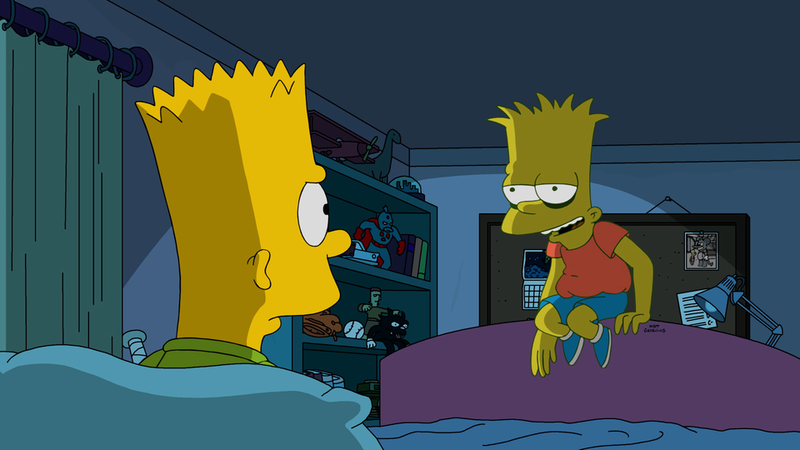 The personification of Bart’s guilt reminds me a bit of Hugo from that TTOH episode. It’s played up as something only Bart can see, because it’s only in his mind, but suddenly at the end Mr. Burns can see it. Because whatever. Oh, this episode is a nonsensical mess. The scene in the junkyard has to be seen to be believed. So another “Bart Bad, Lisa Good” story? Seen it. Like a hundred times. Anyone want to take a stab at explaining the lighting in this shot? I know they add that stupid shadow effect in promo shots, but do they ever really think about it? Do they ever really think about anything anymore? Pretty sure that went out the window about 20 seasons ago or so, whatever number they’re up to now. Good spot. Lighting comes in from 5 o’clock from Bart, but Hugo’s side facing that way is in shadow. Do personifications of guilt have shadows…? What the hell even is this? Tired of taking one for the team, eh? Well, pity, but we can’t blame you. Seconding Dman, in that I instantly thought they were making “Hugo” real when I saw this picture. It wouldn’t have even surprised me at this point. Thought this was Hugo until I read the description. Figured it was another case of ZS referencing classic Simpsons for fan points or something.